WCV: I don't buy it, and strangely I find myself using the same arguments people make against gold. 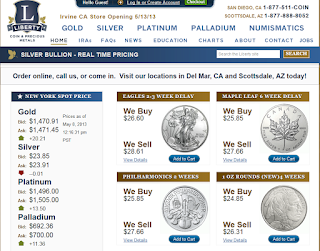 WCV: The thing is gold, silver, platinum, etc. are a very limited number of precious metals. But what's to stop 100 or 1000 or 1,000,000 computer programmers from creating new electronic currencies out of thin air? In that respect, Bitcoins are a lot more like fiat currencies. JF: Right I agree. The matrix reference I didn’t think helped his argument. He could have started the Op ed off my saying “hi my name is XXXXXXX, and I have so much F U money I have decided to give Bitcoin a ride”And that's all I have to say about that. Statcounter is a fun blog tool that lets you know what kind of keyword searches bring visitors to your blog. Just ask Jon Stewart if you don't know how many mass killings there have been in Australia since the gun ban of 1996. Zero! None! Big fat donut! Oh wait, there was this one. SYDNEY — A nurse has pleaded guilty to murdering 11 elderly people by setting fire to the Sydney nursing home where he worked. 1) Rand Paul wants to welcome tattooed hipsters into GOP. 2) Study shows men think women with tattoos are sluts. Today's episode of Greenspan's Body Count comes from the uber-rich Bay Area community of Woodside. When I say uber-rich, I mean sick uber-rich. We're talking billionaires. I think Charles Schwab and Ken Fisher live there. Probably Larry Ellison too. It's down the peninsula from San Francisco, so convenient for both Frisco banksters and Silicon Valley CEOs. It's gratifying when even the dullest tool in the shed catches on. THANK YOU, MR. CHAIRMAN. THANK YOU FOR BEING BEFORE US. WE HAVE HAD MANY CHIP -- WE HAVE HAD MANY YEARS WHEN YOU'RE THE PRESIDENT ECONOMICS ADVISOR AND NOW FED CHAIRMAN. Purchase of three able-bodied twenty-somethings whose other cargo was a 12-pack of Shock Top beer. Supplemental "Nutrition" Assistance Program indeed. Longtime hero of the W.C. Varones Blog Kevin Williamson does what we've all wanted to do in a theater (no, not the Fred Willard thing; the standing up to cell phone jerks thing). Is the lottery really your best shot at avoiding Alpo in your old age? Apparently so. 57% of workers surveyed had less than $25,000 in total savings and investments. 1) Buy any asset that is not yet in a bubble, because it soon will be. Is Janet Yellen just like Ben Bernanke except not a complete moron? Later, as president of the San Francisco Fed, Ms. Yellen sounded early warnings about the danger of a U.S. housing bust. "I still feel the presence of a 600-pound gorilla in the room, and that is the housing sector," she said at a June 2007 policy meeting, according to Fed transcripts. "The risk for further significant deterioration in the housing market, with house prices falling and mortgage delinquencies rising further, causes me appreciable angst." Three months later, she foresaw a dangerous economic cascade. The San Diego County Taxpayers Association on Thursday issued its annual awards for bad government — and good. Remember the physical gold shortage of 2008? Spot prices were down, driven by leveraged futures traders, but people trying to get their hands on physical at anywhere near spot prices were out of luck. Well, the same thing is happening in silver today. The spot price got crushed alongside gold in April from $28 to about $22, now just below $24. But try to get some silver at that price. Delivery delays of weeks, and stunning premiums of $4 - $5 over spot! fresh tracks in the office bathroom. The federal government says Indiana's suicide rate among its middle-aged population surged nearly 54 percent from 1999 to 2010, giving the state one of the nation's biggest such increases. Thursday's report from the Centers for Disease Control and Prevention shows Indiana's suicide rate increase among people ages 35 to 64 was nearly twice the national increase of 28 percent. The CDC report's 11-year time-frame includes the recession and the mortgage crisis, yet it doesn't indicate what may have driven the increases in middle-aged people taking their own lives. But researcher Thomas Simon with the CDC's Injury Prevention Center says some of the possible factors behind the increases could include the baby boomer generation's historically higher suicide rate, the impact of the recession and increasing substance abuse.Yeah, substance abuse. That's it. They didn't have drug addicts in the 90's. Who knew Howard Stern was the lead singer of REO Speedwagon? If you'd asked us an hour ago who sang the early 80's power ballad "Keep on Loving You," we'd have guessed Journey or Foreigner. And we wouldn't have been able to name a single song by the actual band, REO Speedwagon. Thanks to the magic of the Sirius Satellite Radio, we now know the truth. And thanks to the magic of YouTube, we've discovered a wonderful lost video. 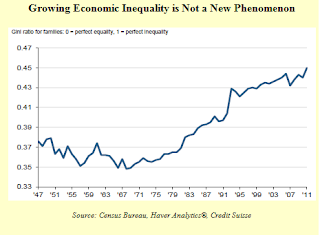 The start of growth in income inequality coincides with what historical event? ANSWER:dbbeebs and DooDoo Economics nailed it. In 1971, President Nixon, an admitted Keynesophile, took the dollar off the gold standard and turned it into a pure fiat currency managed by the propeller-heads at the Dirty Fed. For more on how Fed money-printing creates asset inflation for the rich and food and energy inflation for the poor, please see January 2011's Government-sponsored income inequality in the U.S.
P.S. Note that the exact same time is when commodities went Full Retard and hourly wages decoupled from productivity.